Having already made the party rounds in Aruba—where he may or may not have hooked up with a 16-year-old girl—Rob Gronkowski has apparently moved on to South Padre Island, Texas. At least, that's where we think he was when this photo of a funneling Gronk was tweeted at Adam Schefter sometime last night, where it was first discovered by those scuzzy sleuths over at Busted Coverage. It seems Gronk had been spotted drunkenly munching on pizza in a golf cart while wearing Zubaz pants somewhere on South Padre Island the night before, so we're assuming he was still there when this one was taken. This has pretty much been Gronk's routine since the night of the Super Bowl, hasn't it? Yo soy fiesta, indeed. 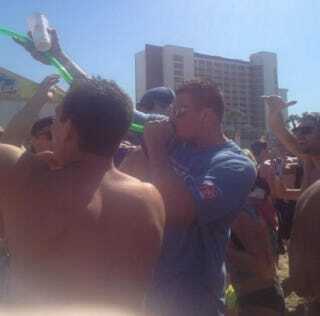 Update (10:43 a.m.): A reader named Cameron writes in with the following: "That photo of Gronk was for sure taken at South Padre. That piece of tent in the background looks like the Geico tent that was set up all weekend. Later in the day he and some friends were dancing on the stage at Coke Beach, at the Isla Grand Beach Resort. Seemed to be enjoying himself." SEE ALSO: Did A 16-Year-Old Mass. Lass Hook Up With Rob Gronkowski One Steamy Night In Aruba?